Can you say TOP 10 DAY? If you believe the forecast, and why wouldn't you, it should be SUNNY, mid 60s to low 70s, low humidity, and a light NE breeze. The Friday ride will start and end at Meadowbrook Orchards in Sterling. They will be open for coffee, pastries, and porcelain in the morning and a full lunch when we get back. Just as a side note, Meadowbrook Orchards is celebrating its 100th anniversary on June 16 with a pig roast, tours, and more! The ride will feature some Mary Had A Little Lamb stuff in Sterling, 5 miles of the Mass Central Rail Trail, a very pleasant backroad to Holden, and the Old Stone Church. The 750 feet elevation gain looks kind of daunting, but almost half of it is one category 5 hill in West Sterling. The payback is nearly 8 miles of mostly downhill back to West Boyleston. How about a Harvard Track Ride Tomorrow (Thursday)? The weather forecast for tomorrow looks TERRIFIC! It should be SUNNY, near 70 degrees, low humidity, and a light NW breeze. I had so much fun on the afternoon Recreation Ride in Harvard a few weeks ago that I decided to "re-cycle" it tomorrow. The Rescheduled, Substitute, Exploration Ride features the Shaker Villages and Shaker "lollipop" Cemetery. No trip around Harvard would be complete without riding UP Oak Hill, yes, its a category 5, but its not that steep, just long. Hopefully there will be some views from the ridges. Then its a bunch of downhill fun on the way back. That loop is 15 miles. Since its supposed to be such a nice day, I added an optional 7 mile loop around Bare Hill Pond if anyone is interested. We can have lunch at Sorrento's afterwards. Elevation Gain = 650 feet (more difficult). Unpaved = 1 mile smooth dirt. Hopefully the weather will cooperate enough to get a local ride in between the Showers and Thunderstorms forecast for tomorrow. Its supposed to be Mostly Cloudy, Warm and Humid with temps in the mid to upper 70s. The Substitute Exploration Ride features the Shaker Villages and Shaker "lollipop" Cemetery. No trip around Harvard would be complete without riding UP Oak Hill, yes, its a category 5, but its not that steep, just long. Hopefully there will be some views from the ridges. Then its a bunch of downhill fun on the way back. The Substitute Exploration Ride will leave at 9:30 AM. The Friday ride will start and end at Meadowbrook Orchards in Sterling. They will be open for coffee, pastries, and porcelain in the morning and a full lunch when we get back. I couldn't work in the Wachusett Reservoir and still get out to the Mass Central Rail Trail on this ride. The 750 feet elevation gain looks kind of daunting, but almost half of it is one category 5 hill in West Sterling. The payback is nearly 8 miles of mostly downhill back to West Boyleston. Here is the Route Map for tomorrow (Monday, May 28th). Its 23 miles, 550 feet elevation gain (moderate) with a few steep uphills followed by lovely downhill runs. Hope to see you tomorrow morning at 9:30 AM at Larter Field in Dunstable. The weather is looking much better for tomorrow, so i will schedule a special ride. I haven't worked out all the details yet, but let's meet at Larter Field in Dunstable @ 9:30 AM and we'll do a 20-25ish mile ride with the normal sort of hills you get in Dunstable. The weather for Wednesday looks questionable at best, so I won't jinx it further by scheduling the Providence ride. For now I will leave it TBD and figure out something as we get closer. Friday however looks like the pick of the week and possibly a top 10 sort of day! I am working on a ride the starts at Meadowbrook Orchards in Sterling and explores the Wachusett Reservoir, the hills of Lancaster, perhaps some Mary Had A Little Lamb stuff and the Mass Central Rail Trail. Meadowbrook Orchards opens at 6:30 AM and they have coffee, pastries, and porcelain. We will return there for lunch which was delicious but a bit slow last time we were there. We will leave at 9:30 AM. AR Index - Roughly equal to TBD flat. paved miles. On Wednesday, May 30th - TBD. On Friday, June 1st - Sterling - Meadowbrook Orchards. The Assabet River Rail Trail is one of our favorite routes. Let's give them some feedback! Please share this urgent need with everyone you can. The annual review of all greater Boston transportation projects by the MPO (Metropolitan Planning Organization) has started. The ARRT project for Acton-Maynard is under a greater than usual threat this year, with the TIP committee recommending that our project be dropped from the 2016 construction budget. Their final vote on this is mid-June and the end of the public comment period is May 31st. We would appreciate your comments in support of the ARRT, sent to the MPO. There are a few showers around and we could get wet. Due to popular demand, I have shortened up my ride description to "blah, blah, blah, Lunch at Dolce Wood - Fired Italian Grill, blah, blah, blah, Beer, blah, blah, blah". For the retro-grouches among us :-) the weather for tomorrow is looking Mostly Cloudy, around 70 degrees, little wind, but a bit humid. The rain should hold off until later in the afternoon. Its actually good riding weather, since the sun won't be beating down on us. The route starts off as one of my fairly standard, but still scenic, routes to Hollis NH. From there we head to Nashua on some beautiful, mostly downhill back roads. Then its a bit more uphill to avoid the boring residential areas of Nashua before we get to Mine Falls Park. We will ride along the river to Downtown Nashua before turning back to ride along the canal back to Mine Falls. From there, it is a fairly boring ride along Route 111 (very nice wide shoulder) to the Nashua River Rail Trail and back to East Pepperell. So, I am planning a ride starting in Groton Center and exploring Devens, Mirror Lake, Lake Shirley, Flat Hill, etc. Lunch is at Filho's Cucina when we get back. The Groton weather forecast is for Partly Cloudy and mid 70s. Elevation Gain - 570 feet (not bad for 27 miles). Unpaved - 1/2 mile (mostly smooth). AR Index = Roughly equal to 32 flat paved miles. So, I am planning a ride starting in Groton Center and exploring Devens, Mirror Lake, Shirley Center, etc. Lunch is at Filho's when we get back. I haven't worked out all the plans yet, I will send all the details later. Well, despite the beautiful weather we had this weekend, Monday is supposed to be cloudy with a few showers in the afternoon :-( The forecast calls for Mostly Cloudy and mid 60s in the morning and upper 60s and a 30% chance of rain in the afternoon. Hopefully, we'll get the morning ride in at least. The morning ride will feature a trip to Massapoag Pond and after a noticeable hill we will cruise down to Keyes Pond on the way back. The afternoon ride will also pass Keyes Pond on the way to Nabnassett Pond and we will return by way of Burges's Pond in the old East Boston Camps. At 11:30 AM, we will have lunch at Pizzeria Presti. If the weather cooperates, we'll have a picnic, otherwise we will eat at the restaurant. The weather doesn't look that good, but I will schedule the inaugural AdventuRide from Providence, RI to Bristol, RI on the beautiful East Bay Rail Trail. We will have lunch at Redlefsen's Restaurant before heading back. It doesn't look like sliding it until Thursday will help with the weather :-( Stay tuned. We will start in East Pepperell, ride to Hollis and then Nashua. We will spend quite a bit of time in Mine Falls Park (smooth dirt trails) before returning to Pepperell for lunch at Dolce's. Friday's weather forecast is for SUNNY and Pleasant. It should be about 60 degrees and little wind when we leave and near 70 degrees when we get back. Definitely a top 10 day! Check out the picture from today's ride! The Friday Fitness Ride will tour the rolling hills of Lunenburg, Shirley, and Townsend. Along the way we will visit Lake Shirley, Hickory Hills Lake, and Pearl Hill State Park. The route features many rolling hills, but only one significant hill, beautiful views, and scenic backroads. We will meet at the parking lot in Lunenburg Center between the Teen Center and the Senior Center. The Senior Center may be open for bathroom use, but ease up on the coffee just in case. There are a few PortaPotties along the way. Unpaved: None - Although the pavement is generally rough. AR Index : roughly equal to 34 flat, paved miles. I can still hear the weather gods laughing behind my back for Monday's lack of ride canceling rain :-( Hopefully they have had their fun for the week and the forecast for Thursday will be right. The Portsmouth weather for Thursday is looking SPECTACULAR! It is forecast to be about 60 degrees, SUNNY, with a WNW breeze (mostly an off-shore cross wind) when we leave. On the way back it should still be SUNNY, near 70 degrees, and still on off-shore breeze. I need to pick up my kids from school at 3:30, so I am going to move the start time to 9:30 AM so we won't be in a rush. Also, by leaving at 9:30 we can get to Portsmouth before noon and beat the lunch crowd. If people are interested in carpooling, RSVP and I will put you in touch with other interested riders. I will probably just drive myself since (a) I'm a guy, and (b) I can blast off straight from Hampton Beach to Parker afterwards if we have too much fun. NOTE: I can't do a Wednesday ride this week, but its supposed to rain anyway. The Exploration Ride will go to Portsmouth on THURSDAY. Well, despite the beautiful weather we had this weekend, Monday isn't looking so good :-( The forecast calls for low 60s and a 50% chance of rain in the morning and around 70 degrees and a 50% chance of rain in the afternoon. Hopefully, the weatherman is wrong! Route Map - Lunenburg to Flat Hill and Pearl Hill State Park. Distance = 26 1/2 miles. Elevation Gain = 750 feet (more difficult). We can have lunch afterwards at Bangkok Hill - Original Thai Cuisine. Well, the forecast calls for Partly Sunny, mid 50s, and a wind out of the NW when we leave. It should be in the low 60s and cloudier when we return. We will be riding into the wind on the way to Brookline, but we should have a tailwind on the way back. If its not good picnic weather when we get back, we can go to the Bull Run in Shirley for a change. On Friday, we will meet at Cutler Field in West Groton and ride to Brookline, NH. The route will be about 26 miles long and somewhere around 700 feet elevation gain. Most of the elevation gain is on Wallace Hill Road getting up to the ridge in Townsend with beautiful views of the mountains of Central Mass and Southern NH. 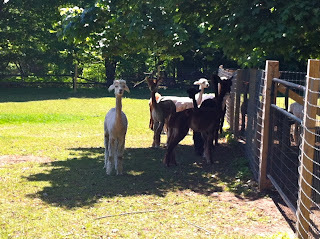 We can have lunch afterwards at the Clover Farm Store in West Groton. Starting Point Map - West Groton - Cutler Field. Route Map - West Groton - Brookline - Pepperell. Elevation Gain - 700 feet (more challenging). So I scheduled a ride from Shirley Center tomorrow instead. Hopefully the weather will be better inland. 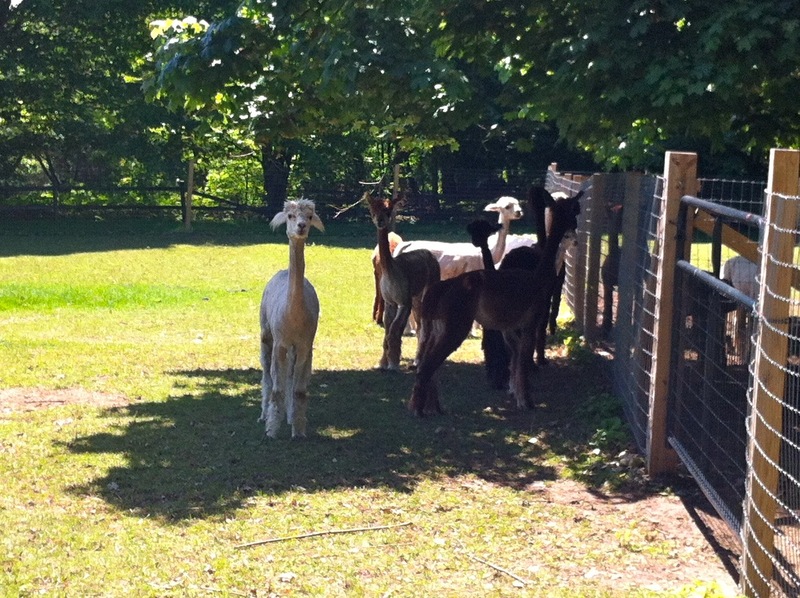 We will visit Holdenwood, Lake Shirley, the Alpacas in Lunenburg, and Hickory Hills Lake. The weather forecast for Monday is looking fantastic! It should be SUNNY around 60 degrees in the morning and still SUNNY and around 70 degrees in the afternoon. The morning Recreation Ride features the beautiful mountain views from Prospect Hill, although there is a category 5 hill (the easiest hill) getting up to the view. We will also stop and see lots and lots of goats on our way to Bare Hill Pond. We will stop at the beach and hopefully we won't get thrown out. The afternoon Recreation Ride features the Shaker Villages and Shaker "lollipop" Cemetery. No trip around Harvard would be complete without riding UP Oak Hill, yes, its a category 5, but its not that steep, just long. Hopefully the apple, peach and purple magnolia trees will be in bloom. This is the highlight of my cycling year. Its a beautiful ride and you can do 25, 50, 62, or 100 miles in either one day or two. I typically tinker with the ride (I can't help myself) and last year we did a 62 mile ride to Cape Neddick and the Nubble Lighthouse. Other years we have done 50 miles on Saturday and 50 miles on Sunday. The 2012 Granite State Wheelmen's Seacoast Century Weekend on September 22-23 is now open for registrations. One $35.00 fee (plus Active.com's service charge) covers both days, $45.00 after July 31. For more info and to register, please visit www.GraniteStateWheelmen.org. Hope to see you in September at our 39th annual Seacoast Century! Well, it doesn't look like weather gods will be smiling on us tomorrow :-( The forecast is for mid 50s, 60% chance of rain and light winds. The weatherman has been wrong before, so I won't make the GO / STOP call until tomorrow morning before 8:00 AM. On Friday, we will meet at Cutler Field in West Groton and ride to Brookline, NH. The route will be about 26 miles long and somewhere around 700 feet elevation gain. Most of the elevation gain is on Wallace Hill Road getting up to the ridge in Townsend with beautiful views of the mountains of Central Mass and Southern NH. We can have lunch afterwards at the Clover Farm Store in West Groton, or there is always Filho's. The weather forecast for Portsmouth tomorrow doesn't look very good :-( Cloudy, upper 40s and NE wind off the water isn't worth driving an hour each way to experience. The forecast for Groton isn't much better, but it should be a few degrees "warmer" and less windy. So, I've scheduled a ride from Groton Center to Pepperell on the Rail Trail and returning by way of Dunstable. The route is about 20 miles long with about 350 feet elevation gain. We can warm up with a delicious lunch at Filho's Cucina. We should return by 12:00 Noon. Route Map - Groton - Pepperell - Dunstable. AR Index = Roughly 22 flat, paved miles.